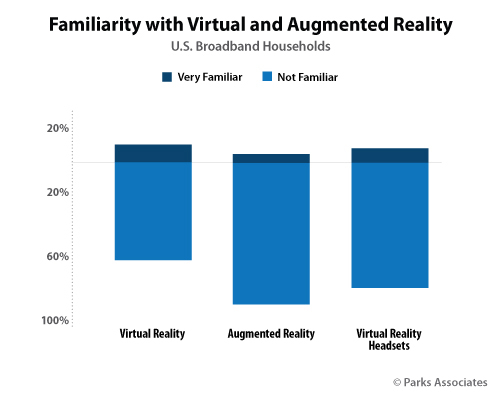 “Despite the recent industry excitement around VR, overall consumer awareness of this technology is low< " according to Brett Sappington of Parks Associates. “Virtual reality has the potential to have significant impact on many market sectors, particularly those that benefit from immersion and engagement,” Sappington said. “Despite the recent industry excitement around VR, overall consumer awareness of this technology is low. He made the remarks during last week’s Connections even in San Francisco. Sappington and Barbara Kraus also presented their top 10 list of disruptors in connected entertainment: 1) Virtual reality; 2) Live streaming; 3) Voice control; 4) Pay TV as the new OTT; 5) Devices as smart home controllers; 6) Integrated discovery; 7) Device makers and streaming services; 8) 4K + HDR; 9) Privacy and security of data; and 10) Redefining video game entertainment. Other topics discussed during Connections topics included consumer privacy, media piracy, big data, and the emergence of voice as a key user interface, with Amazon driving this change through Echo and Alexa. “As discussed in the Risky Business: Piracy and Protecting Content in an OTT World session on Wednesday, piracy of premium and pay-TV content can be successfully mitigated by technological means in combination with effective policies, business models catering to consumers’ expectations, and ease of content discovery, navigation, and use,” said Petr Peterka, CTO of Verimatrix.